Feel the difference soaking in our therapeutic natural ionic mineral bath can make! Indulge Your Senses In Your Private TRUlyPŨR HOME SPA Retreat! Now you can turn your bathroom into a private healing retreat to relax and rejuvenate your entire being … body, heart, mind and spirit! Imagine soaking away your worries, cares, aches and pains in a soothing, restoring and therapeutic ionic super mineral solution home bath spa. With TRUlyPŨR HOME SPA you can have your very own inviting ‘oasis of tranquility’ or a ‘quiet sanctuary’ to help detoxify and bring you back into balance. As your tub begins to fill with hot water, pour some of our healing restorative ionic mineral formula in your bath. 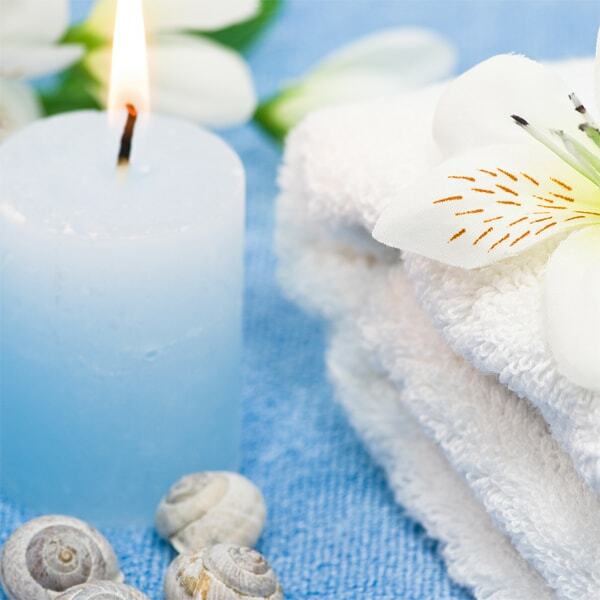 To help get all your senses ready for a more holistic and full sensory “spa treatment”, try adding some soothing essential oils in the water and perhaps some flower petals and/or bubble bath for an extra feeling of luxury. Before you step into serenity … turn off the lights, and let yourself TRUly unwind in the soft glow of candles, and peaceful relaxing music. 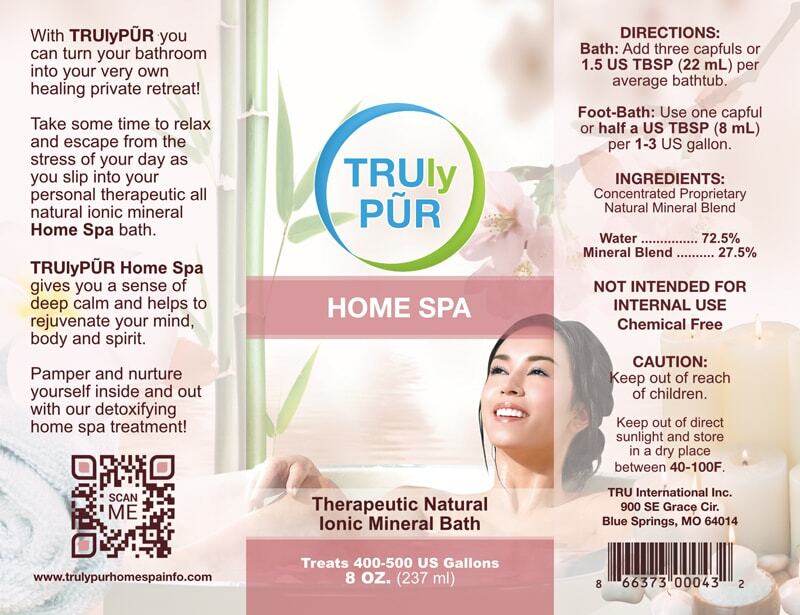 How is TRUlyPŨR HOME SPA different from other spa additives? We are blessed to have a unique and patented formulation process that harnesses the healing and purifying power of Mother earth’s natural self cleansing capability through volcanic activity and super minerals. The TRU essence of TRUlyPŨR HOME SPA is about you beginning to nurture your entire being and helping you to naturally detox and release all those harmful chemicals in your body. It combines the acuity of science with a more holistic approach enabling your body to function as is it meant to and come into a healthier balance. The hot water increases the effectiveness and potency of the ionic minerals giving you an enhanced powerful cleansing and restorative bath. More people are now becoming aware of what our ancestors have known for thousands of years; the amazing healing and rejuvenating benefits that comes from soaking in natural hot spring spas, or geothermal outdoor springs spas. Once you have experienced the healing powers of the earth and nourished and nurtured your skin, body, heart and soul; you will yearn for more of the same. However, not everyone has the time nor resources to go to spa resorts and some of the best healing natural geothermal hot springs in the world are secluded and in hard to reach isolated areas, Iceland to name just one. Is there a way to get similar benefits that you can enjoy anytime you wish and just when you need it the most? Yes. 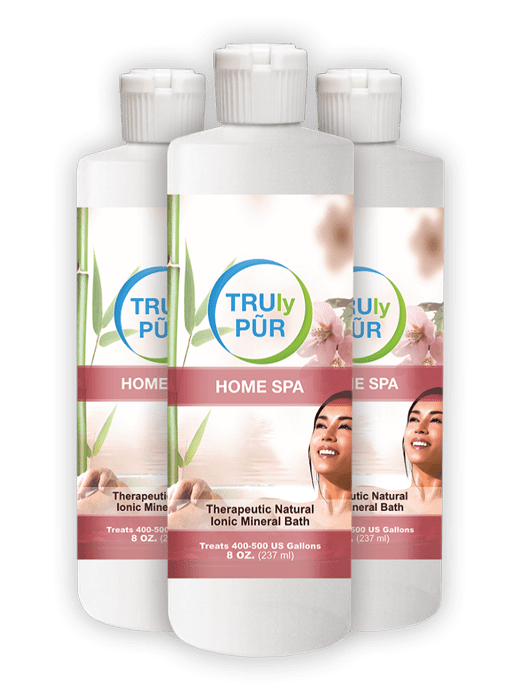 TRUlyPŨR HOME SPA has healing liquefied ionic super natural minerals and salts in a purified water solution that you can pour in your tub anytime you need to soak away tension, aches and pains. Give your tired and sore feet some loving care with a refreshing foot soak! When you just don’t have the time for a long bath TRUlyPŨR HOME SPA is convenient and easy to use for soaking your feet. All you need to do is pour some hot water in a foot tub or foot spa massage bath, add some TRUlyPŨR HOME SPA and let it do its magic! When you begin to feel the slight tingling in your feet you can feel confident that it is doing its job of helping to pull out toxins and soothe those aching tootsies. The great thing about a foot soak is that you can do it anywhere; at your desk or while you are relaxing with your favorite show. 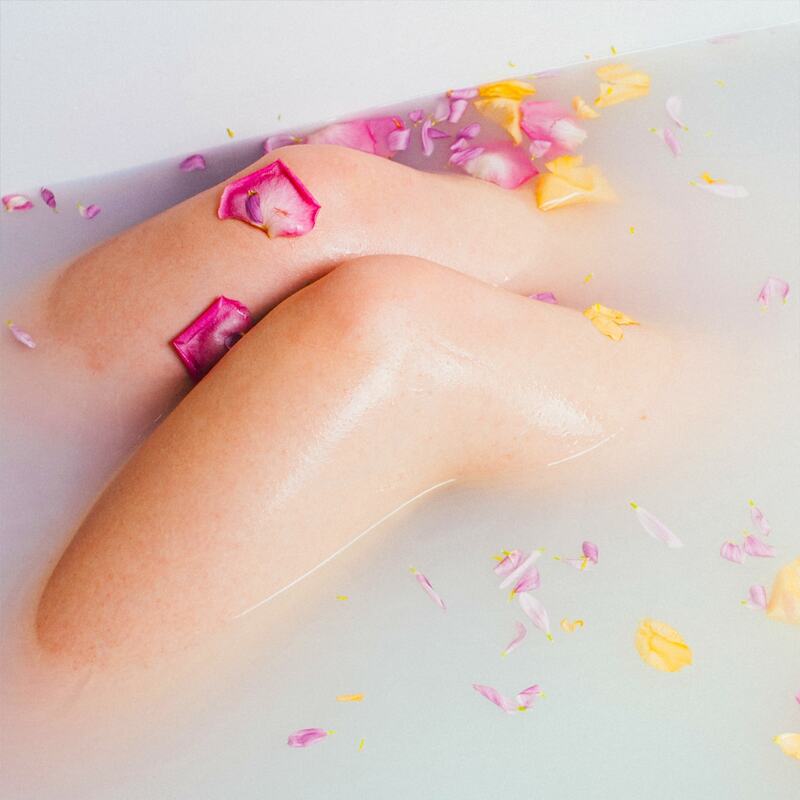 After spending some time in your ‘spa’ whether in your tub or foot soak, you may, like many others find that your mind is clearer, your body feels rejuvenated and renewed. 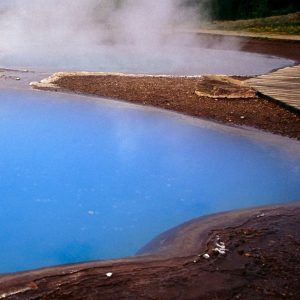 A Little History Why Hot Spas & Geothermal Pools Are So Special! The ancients had it right after all! Spas, as we know them today, have a long history dating back thousands of years. The ancients believed, and rightly so in many respects, the curative powers of mineral waters and hot springs. There seem to be two ideas as to where the word for ‘spa’ itself comes from. One is that it is derived from the Latin phrase salus per aquae or “health from water”; while another is that it originated from the Belgian town of Aquae Spadanae (Spa) which was well known since Roman times for its mineral-rich thermal waters. Either way, both ideas are connected to the amazing restorative power that that our earth has to cleanse, purify and heal itself. This ‘gift’ of purification has been passed along to us through various essential ionic healing minerals and natural mineral salts. 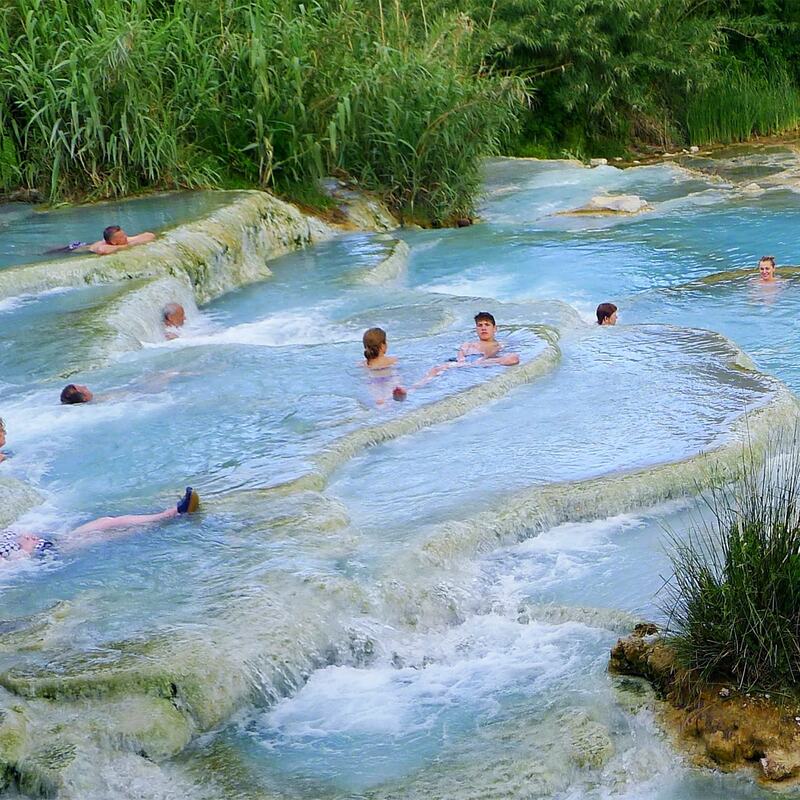 The healing power of heated natural sulfur springs, hot water rich in proper minerals, is gaining more attention as being both preventative, therapeutic and rehabilitative for many health conditions. When you add the bubbling soothing effect some of these springs have, it adds a heightened hydrotherapy massage to your relaxation and health benefits. We are now beginning to more fully understand what people thousands of years ago naturally understood; the importance of getting in touch with Mother Earth’s bounty. In just one respect to this is realizing the importance of our symbiotic relationship with our planet and how many natural benefits we can have from having access to the ‘right kind of water’ can help us develop and nurture a deep sense of inner well-being. TRUlyPŨRHOME SPA has found a way to tap into the healing power of cleansing volcanic minerals from deep in our oceans and bring them to us in a liquefied state; making it easier than ever before to help us detoxify and replenish nutrients! If you have a whirlpool or air bathtub you can take your HOME SPA to a hydrotherapy massage and take relaxation to a ‘whole’ new level. Make Time For Relaxation And Healing! Of Our Natural Ionic Mineral Bath! 1. What are some of the benefits of soaking in our mineral bath? A clearer complexion, healthier looking skin, decreased inflammation in swollen joints, help the lymphatic system, respiratory problems and various skin inflammations, improved circulation and blood flow, relaxation and relieved stress and improved sleep. One thing to keep in mind about soaking in hot water for long periods of time. To keep your body hydrated, drink some water before your bath and if you find you are lightheaded drink some more during and after your detox bath. It is good to remember that since it is a detox bath that you may feel a bit dizzy when you get up from all the detoxification that your body has just had. This is completely normal, so just go slow and careful and replenish your body with water. For added benefit add TRUlyPŨR water drops for ongoing great tasting healthy water. 2. 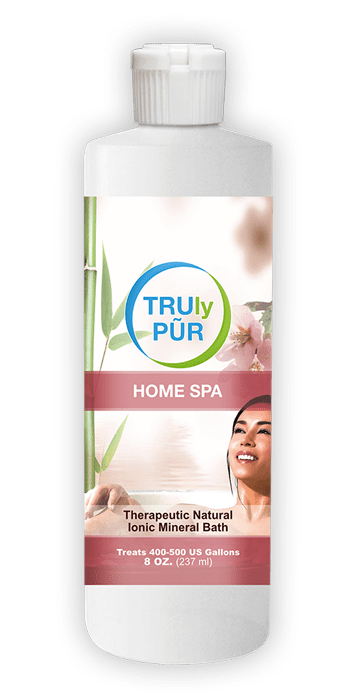 How does TRUlyPUR HOMESPA help the body detox? A: The various proprietary minerals and natural mineral salts work with your body to ‘open it up’ so as to be able to help them pull out the harmful toxins, contaminants, heavy metals among other things. For example, in the first 20 minutes of your therapeutic ionic mineral bath the magnesium and sulfur are able to penetrate the skin and ‘reaching’ deep within to the various impurities and help to safely pull them out into the bath water. Since these various ‘impurities’ are rendered inert there is no harm or risk to your body. 3. What if I have water that has chlorine or other impurities will this be absorbed into my body? No. The way TRUlyPŨR HOME SPA works is that the harmful chemicals such as chlorine and other additives will become neutralized or inert when it is mixed with your spa bath. You can feel safe and relaxed you are doing the right thing for the detoxing and cleansing benefits of you and your family. 4. Is it safe for children to bathe in? Yes. However, for really young children, as always with a view to their safety, they should be supervised by an adult. 5. Will detoxing take out the good minerals and well as the bad? It would seem that with some of the salt-based detox products that could be the case. However, with TRUlyPŨR HOME SPA and its unique properties not only is harmful toxins drawn out but good minerals are able to be absorbed in. So, instead of having a 20 minute detox bath; continue to relax and soak in your home spa for at least 20 to 40 minutes more to let your body absorb all the rich nutrients it can. 6. Will detoxing dry out my skin? No. You will find that after soaking in our hot ionic mineral bath that your skin will feel clean, moisturized, glowing, soft and silky. This is due to magnesium salts helping to moisturize your skin by a process called osmosis. Because these amazing mineral salts naturally attract water, when you soak your skin in TRUlyPŨR HOME SPA they reach out to nourish the water deep within your body and it is like you are being moisturized from the inside out. These mineral salts also gently exfoliate and remove away all the dead skin cells from the outer layer of skin, opening up the way for your skin to better absorb the needed nutrients and moisture that it needs. 7. How often can I take my TRUlyPŨR HOME SPA bath? You can easily take a bath at least once a week. However, if you think you need to detox more, you can safely bath in your TRUlyPŨR HOME SPA one to three times a week. 8. 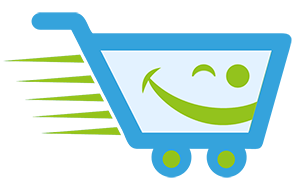 Will using TRUlyPŨR HOME SPA hurt my whirlpool, hot tub, or air bathtub? No. 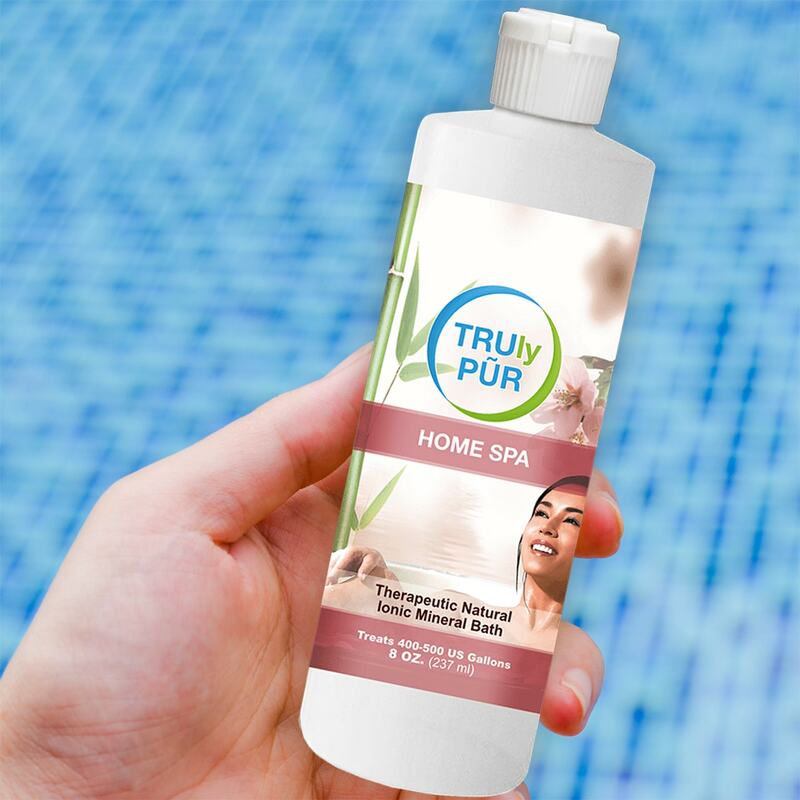 Unlike other types of ‘bath salts’ TRUlyPŨR HOME SPA’s unique liquid formulation will not rust or clog the mechanical parts. TRUlyPŨR HOME SPA comes in a 8 oz (237 mL) bottle which treats about 400-500 US gal (1514-1893 L) of water. Bath: Add three (3) capfuls or 1.5 US TBSP (22 mL) per average bathtub. Foot-Bath: Use one (1) capful or half a US TBSP (8 mL) per 1-3 US gallon.